Apple's iBeacon technology is poised to influence the retail sector by offering a personalized shopping experience to customers, but it may also have personal benefits by interacting with apps when a user is at home. 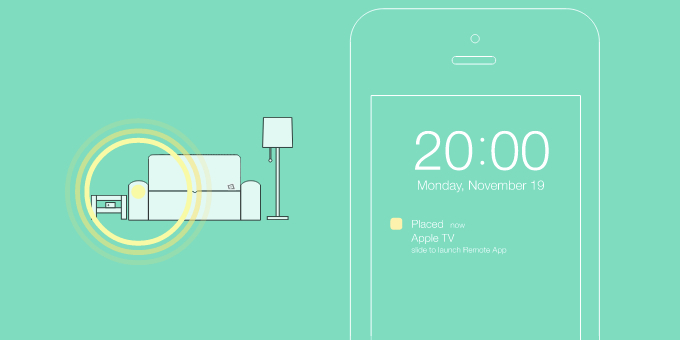 As spotted by TechCrunch, new iOS app Placed gives us a glimpse into personal iBeacon usage, linking an incoming iBeacon signal to apps associated with common household activities. With appropriately placed iBeacons, you could enable the remote when you sit on the couch or start a timer when you step up to the oven to cook. It's an early implementation of iBeacon technology as the app integration is only partially automated, sending a notification to your phone that requires you to manually launch an app before anything happens. It an interesting use of iBeacon technology, though, and a small step towards a wider use of iBeacons the automated home. Besides personal and retail use, iBeacon technology also is being used in sports to assist fans and add to the overall game experience. The Golden State Warriors became the first NBA team to adopt Apple's iBeacon technology, installing the Bluetooth transmitters in the team's home arena, reports Business Week. The iBeacon technology is being used to boost ticket sales by prompting fans to upgrade their tickets as they make their way to their nosebleed seats inside Oracle Arena. The Warriors, as well as other sports teams, already offer seat upgrades through their mobile apps, but this is the first time iBeacons have been used to boost ticket sales in this way. you could enable the remote when you sit on the couch or start a timer when you step up to the oven to cook. There's lots of great potential here, such as music that follows you round your home or automatic lighting using a system such as Philips Hue. The only problem is that due to the sandboxed nature of iOS its success will be totally reliant on how Apple allows the technology to integrate with third party apps through public APIs. Time to force-feed my pets some iBeacons. For… added security. I want an iBeacon that let's my phone know when I'm in bed and automatically puts my phone on silent. So when is the next apple event ?? That's a great idea. Hopefully it's not expensive. So back in January, CalTech had a hackathon. My team focused exclusively on iBeacon technology. Here are some snapshots of what we produced. I do not want to go too much into detail but we produced a working model with Pintrest API (because they were sponsoring) and working with devices such as hue lights, like some people mentioned but we worked on other devices too not to mention we built some of our stuff that we included! As what they showed, Real cool, we could actually build this. Some people mentioned apple sandboxing as an issue, trust me its not we built and already got the main core parts working to get all this stuff going...2 months ago. I just want you guys to know that this is already happening, people are developing, I hope someones excited. I just wish more than just recruiters were at the hackathon, if people gaged the scope of the project I guarantee companies would be far more interested in what we built. The concept (the one which i provided pictures for) also made a simple version to use google glass to be able to do facial recognition (I made a really cool work around to simplify the overheard and make it possible in large scale). The sky's the limit what we can do with this tech. Just wish I had more funding to be able to create more amazing stuff!!! I want less ads around me not them in my home.